Mike, John and Charlie arrived on site bright and early on a Friday morning, greeted by our customer, Dave. 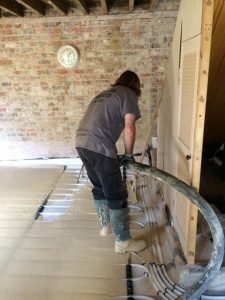 We were presented with a very well prepped period property refurb in a beautiful village in Oxfordshire, screed was being installed across 3 rooms on the ground floor, an area of 63 M2. Having been supplied with measurements by Dave, upon arrival we use our laser measure to get exact square metres. The datum tripod stands are then put out at intervals of 2 metres or less, we use our laser level to adjust all stands to match the datum depth given by the customer, in this case 50mm. This ensures the depth remains exact throughout. After doing a final inspection of the prep work, our provisionally booked material order from Lafarge Gyvlon is then confirmed by Mike with the exact quantities required, this not only ensures that we have enough material, but that there is minimal wastage, saving the customer money. When calling it in, the staff at the Lafarge plant advised a time of arrival which gave us 35 minutes to get our pump set up. 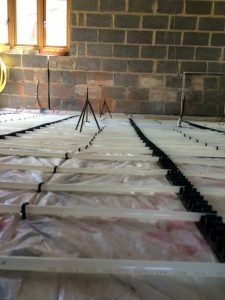 The 2 inch flexi hoses are laid out, primed to ensure no blockages can occur and connected from the pump to the farthest area of installation ready to go. Soon after, George, one of the regular Lafarge drivers, arrived on site. Charlie watched the lorry back on to the pump and dropped the shoot down. At this point, George provided a small sample, which Mike then flow tested to ensure the spec of the screed was as it should be. As always, the material from Lafarge was perfect. The screed was then dispensed into the pump hopper, and whilst John and Charlie were inside ready to go in their wellies, Mike engaged the pump and the screed began flowing into the first area. Starting at the back end of the farthest room, as the area begins to fill up, the screed was then moved around with a spazzle rake to bring it up to the level of the datum stands. This process continues as John and Charlie work their way back through the building, finally ending at the front door. At this point, Mike disengages the pump and an initial dappling takes place. The levels are then inspected throughout to ensure they are accurate before the pipes are removed from the building. The minimal amount of waste is then discarded into the skip provided. The tripod datum stands are removed by Mike and the finishing process begins. This entails a thorough deep dapple of all areas to ensure any high or low spots are flattened out. When this is complete, Mike does a final delicate dapple, ensuring a spot free finish, ending at the front door and stepping out carefully. Finally, all tools and equipment are rinsed off in the pump hopper. The above process has taken little more than 2 hours from start to finish. Just wanted to send you a message to let you know how enjoyable it was to deal with you, John and Charlie today and I want to say a big thank you for the last minute advice and minor mods on site to get to job done. The professionalism and friendliness with which you all operated was refreshing to deal with and you clearly really know your stuff. Even the Lafarge delivery driver commented you guys are good and always go for the best materials (Gyvlon) rather than the other options available. If you ever need a reference I would be happy to provide one for you and if we need another floor screeding in future I will definitely be using you.